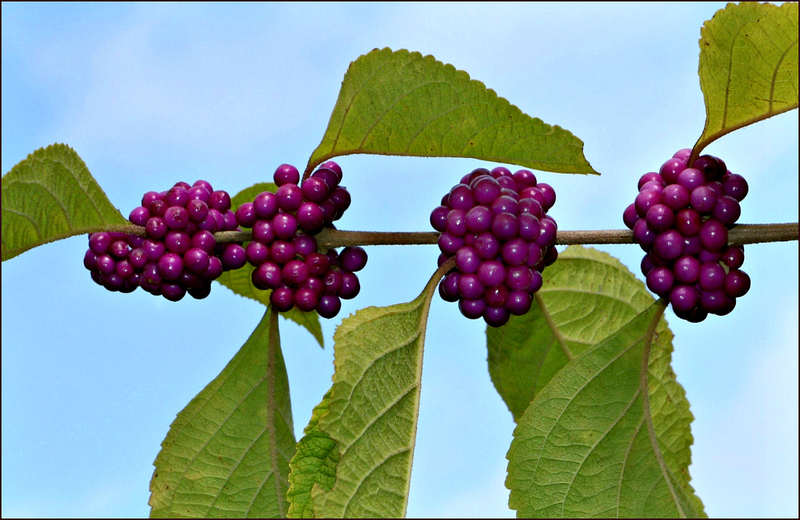 To my eye the loveliest of our autumn fruits, the elegant beautyberry is more than a local delight. Spreading across the eastern third of Texas into Louisiana, Oklahoma, and Arkansas, its form and autumn colors are unmistakable. As its leaves begin to yellow, they complement the developing fruit; once the leaves have fallen, the rich, purple berries decorate winter gardens and landscapes. Birds enjoy its fruit throughout the fall and early winter, scattering its seed so widely the plants can appear almost anywhere: in goldenrod-filled fields; along stream edges; in vine-filled thickets. Should seeds drop in open areas and fine conditions allow the plants to thrive, their enthusiasm for growth is obvious. Reaching high above their companions, they showcase their fruits against the thinning autumn sky: as heart-stopping as any flaming maple, as compelling as the sounds of migration. Once the beautyberry has turned, the season has turned, as well. Are they edible for humans? They are pretty, I’ve got to give them that! Opinion’s divided on eating them raw. The consensus seems to be that they won’t kill you, but some people react negatively to them, and they aren’t particularly tasty. They make a fine jelly, though. One author says that the jelly has a faint hint of rose petals and champagne. The plant’s real value may lie outside the realm of food. The crushed leaves are said to be a natural mosquito repellent, although it’s advised to rub them on clothing rather than skin. Very interesting, thank you, Linda! It’s time to play outside! These berries are landscape accent pieces for sure. Since that last horrendous stretch of heat’n’humidity, it has been lovely. I trust you’re getting plenty of outdoor time, with an assortment of companions, and seeing some lovely sights yourself. That’s a neat plant! It reminds me a bit of craft projects with little kids, working on “fine motor skills” by stringing beads. You’re sure doing a great job finding autumn colors! Beautyberry usually doesn’t grow in New York, but I see the Cornell Cooperative Extension on Long Island (which has a much milder climate than the rest of the state) is suggesting it as an alternative to invasive ornamentals, like porcelain-berry. You’ve reminded me that, as a child, I used to hear adults refer to certain people as “that danged bead stringer.” I know it was a gentle insult of some sort, but I really haven’t any idea what it meant, and I can’t find any reference to it. It must have been a very localized idiom. It’s neat that beautyberry is being recommended for parts of your area. It’s often suggested here as a good replacement for invasive shrubs like nandina. I’d never heard of porcelain-berry. The berries themselves remind me of the pastel M&Ms that show up around Easter. They also remind me of our peppervine, which often has beautiful, multicolored berries on it. Lucky for us that peppervine’s native. The fruit of porcelain-berry is a bit similar, and kind of attractive, but not as pretty as your beautyberry. I looked up the name: Ampelopsis glandulosa var. brevipedunculata. The leaves look like wild grape, and it’s another hanger-on that’s making a pest of itself around here. Now if the botanists could invent a hybrid that produces M&M’s, that would be more like it! or Skittles. We don’t have peppervine, either. But the foxgrapes have been pretty good lately, if you find a bunch of them in the sun, they’re not sweet exactly, but actually pretty good to eat. Fox grapes? Do you suppose they were named for Aesop’s fable about the fox and the grapes? We have wild grapes, too, but I’m not sure they’re good for straight plucking and munching. I know they end up in jelly, or sometimes pie, but a lot of sugar’s involved in making them palatable. On the other hand, fresh from the vine dewberries can be great. If you find a good patch, they can be as sweet as any cultivated fruit. I think you might be right about Aesop. Most of the time, they’re too tart to eat right off the vine. During the summer, we also eat the tendrils on the end of the vines, which are crunchy and taste like lemon. I wasn’t familiar with “dewberries” but I guess we’d call them wild blackberries, and I love those, even better than the cultivated kind. Goodness, how intriguing Nandina is invasive in your area. I have a lot of it in my garden. It is very well behaved. To paraphrase the old saying, one area’s invasive trash is another area’s treasure. In fact, our despised Chinese tallow often is called a “trash tree.” Nandina is pretty, both the leaves and the berries, but it’s not at all well-behaved around here. Thank goodness there are acceptable — and lovely — substitutes. Have you smelled the leaves? I find they have a pleasant scent. I have smelled them, when I was experimenting with crushing them to use as a mosquito repellent. The scent reminded me a bit of lantana, but it wasn’t as sharp. Ah, so now we know where that scent comes from. Like you, I’d noticed a similar and likewise pleasant scent from lantana leaves. Really pretty berries. They don’t grow up here but they would be welcome for the birds! I’m often surprised by how long the berries will linger. I’ve read that birds will take other berries first, but there are accounts of birds like robins moving in and stripping a bush in minutes. I’ve seen mockingbirds eating them, too. They certainly do look good enough to eat. Linda, these are stunning … and appropriately named! I’ve never seen one, but I can readily imagine the birds enjoying them as their regular food supply dwindles. Here, we use Holly to preserve a bit of green and to draw birds with its red berries. I do enjoy fall berries. There are so many varieties, and they’re all so pretty. The truly distinctive ones, like the beautyberry, are easy to identify, but there are a lot of red berries on shrubs and vines that I still don’t know. I’ve been seeing a plant with black berries on a bright magenta colored stem, and finally figured out that it’s pokeberry. It’s not good for eating, but you can make ink from the berries! No kidding. And now that you’ve said that, I”m remembering the taste of Nehi grape soda — or grape bubble gum. We certainly didn’t have very sophisticated palates when we were kids! Well I guess I still have a grape soda palate since I chose to drink the grape (taste only its colorless) magnesium citrate for my last colonoscopy. Yeah I know why ruin an excellent trip down memory lane. Maybe I ought to have gone with a nice merlot? You’re so funny, Judy! I suspect a lot of people would chose the merlot, if given the choice. Speaking of grape and plants, now I’ve remembered our mountain laurel, too. Its blossoms smell remarkably like grape bubble gum, or maybe grape Kool-Aid. The morning I took that photo, there had been dense fog. I like the way some residual fog still is lingering — not quite cloudy, but still a presence. The lighter blue does complement the berries. It’s fun when we share plants. I just spent a minute or two looking at some of your cultivars, and they certainly are pretty. It’s interesting how the color of the berries and leaves varies. You may be surprised Linda to know that I once grew this in my own garden many years ago. Its not commonly grown here especially now that plant nursery sell a limited range of plants to a fashion influenced public. A pity as plants like this are a real feast for the eyes. I’m smiling, because your comment about the nursery trade reminded me of a tale I heard this week. A woman who knows her birds and her native plants stopped by a Houston place that bills itself a native plant nursery, and had no luck at all finding native plants. The few that were tucked into a corner were just slightly bedraggled. She didn’t say, but I had the feeling she might have bought them all, just because she felt so sorry for them. What a lovely addition to your garden the beautyberries would have been. Slowly, slowly, I’m finding more patches of them around here. As our leaves start to fall, it will get easier. I’m curious what their size is in their native habitat? And yes, I feel sorry for plants in certain circumstances. Our species varies a lot. I know there are cultivars that are meant to stay around 3′-5′, but most plants I find out and about are in the 5′-6′ range. The plant I photographed here was probably 6′-7′, since I could stand and take photos without having to stoop — always a benefit. OK thanks yes mine I recall was around the 5’6″ mark. Shocked they have stunted a glorious bush like this. I shouldn’t be though, humans seem to do many inconsiderate acts – across the whole range! Beautiful fruit. No wonder the birds feast on them. They are almost begging to get eaten. Isn’t that the truth? Forty species of birds are said to enjoy the berries. Many people say the jelly is quite good, too. A woman who obviously does a good bit of jam and jelly making had some for sale online. I say “had” because I just snagged her last two jars — one for a friend at Christmas, and one for our Native Plant Society gift exchange in December. My friend, of course, will be expected to share. Beauties indeed. What a luscious purple color they are. Not fit for human consumption, I take it? Opinions vary on them as a snack. It seems they’re not toxic, but they may lead to a little stomach upset. Of course, that’s true with nearly every food: cucumbers and oranges come to mind as foods some of my friends won’t eat because of their effects. I’d put beautyberry in the same category as agarita: good for jelly and wine, but otherwise not worth the trouble. I’m hoping to find some stems to bring home and put in a vase this year. The ones I’ve seen have been in parks or refuges — no picking there! But there may be a gardener around who has some, and wants to prune anyway. Those don’t even look real! They are shockingly stunning — never seen these but oh, what a treat to see them in the wild. They would just pop! They do have the look of the artificial holly berries and such that are used in holiday decorations. When they’re in their prime, they’re so plump and shiny, they’re easy to spot even when they’re hidden away in the woods — they fairly glow. Now that I say that, I wonder if anyone’s ever manufactured faux beautyberries. (I looked, but couldn’t find any.) I have some bittersweet that looks so much like the real thing, it’s amazing. Beautyberry is such a fun plant. I like your idea to make the image horizontal. My mother had one in western North Carolina, and there’s a species from China with purple leaves as well as berries that grows here in western Washington (at the local arboretum). The writing in this post is spot-on perfect – that third paragraph, lovely! Actually, I didn’t make the image horizontal. That’s the way the branch was growing. It was one of several at the top of the plant that seemed to have given up on “up” in favor of “over.” I wish I’d been able to capture the whole of the scene better than I did. The beautyberry was combined with a variety of goldenrod that was equally tall, and the purple and gold was a fabulous combination. I do love autumn, and I enjoy writing about it, even in little snippets. I’m glad you enjoyed my few words, too. I adore the American beauty berry which I first obtained from some twigs that I broke off from a wild shrub near Lake Sam Rayburn lake in east Texas about 45 years ago. I love my plants and let them grow where ever they sprout. I really should increase my plants and put some twigs in the spring earth this coming year. The birds feed on the berries but not all the time. They of course are finding plenty of food this time of year. Your photo is lovely and you did a great job of show casing berry’s beauty. When I first became interested in native plants, I looked for beautyberry for at least two or three years before finding any. I suspect there was plenty of it around. I just wasn’t able to see it. Now that I know the plant, I can sometimes spot it even without the purple berries. I don’t know much at all about birds’ food preferences, but I have noticed that some berries disappear far more quickly than others. I’ve also noticed that I haven’t seen a single mulberry stain on boats or cars this year. I wonder if something — too much rain, perhaps — caused the mulberry trees to throw off their fruit before it ripened. I’m glad you like the photo. I was pleased to find a way to isolate the berries and really show them off. I’m dreaming of the day I’m able to photograph the blooms. Apparently they don’t last too long. What rich colors and textures! I saw the flowers and berries in every stage of development this year in a local public garden, but was so focused on something else I didn’t take any photos of them. I regret that now, but at least I’ll know where to find them next year. You’re certainly right about the rich color. It’s surprised me how much the color can vary. The deepest berries can be almost burgundy, while others contain a hint of pink. But the clear, deep purple is my favorite. That’s a wise approach. I’m cautious even about things that are declared edible on websites. Many of the people who forage will say this or that is “edible,” but when you read the fine print, you find out that it’s only safe after being rinsed, cooked in three waters, strained, aged, or otherwise processed. There’s also the issue of taste. Apparently these berries look better than they taste: at least in their natural state. It seems they make a fine jelly, and that they can be made into a passable wine, but otherwise most people seem to agree that leaving them for the birds is just fine. The berries are an eye-popping purple. I was wondering what sort of dye they would make but the only reference I could find suggests that the dye from the berries is yellow which seems odd given that the jelly is such a pretty reddish colour. Even in the plant world, it seems appearances can be deceiving.